The extra-large touch surface of about 23cm², tactile surface design and optical and acoustical signals meet the special requirements of people with disabilities. The low profile design has the advantage of a space-saving assembly and adds to the visual appeal of the unit. The CK-Push Button series meets all standards for the use in busses and rail vehicles. Where required, the Push Buttons can be delivered as TSI PRM conformable versions for people with reduced mobility to locate the Push Button in- and outside the train. The CK-Push Buttons are dust and waterproof per IP67 protection ratings. Microcontroller electronics make a wide variety of functions possible such as extended voltage ranges and optical signaling i.e. flash frequencies. 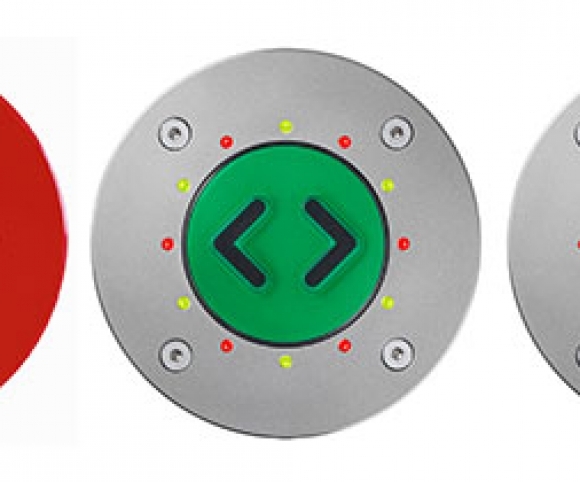 The large selection of stainless steel covers, pictographs, touch surface-varieties and different led-colors make a wide range of customized CK- Push Button versions possible. Beyond the single Push Button ESCHA TSL offers a customized Panel solution for the direct installation in wet rooms for example. The panel integrates different switching functions in a single mechanical unit.